HOW FAR WILL SSEBAGALA GO? Ssebagala needs to get to his senses and do things the right way. He is a laughing stock. He has the money, but fails to get right legal advice. Former Kampala Mayor Nasser Ssebagala has been evicted from the residence of the Town Clerk along Ssezibwa Road amidst tight security. 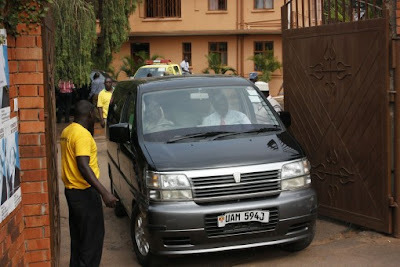 He has been claiming that he acquired the house with the blessings of President Museveni, and many pundits believed that Museveni had given the house to the former mayor as a “gift” after “seeing the political light.” Shortly before the recently concluded elections, Sebagala abandoned the opposition and “gave his behind” to Museveni. He moved around the country with the President campaigning for the ruling NRM. Ssebagala’s eviction follows court orders after the Kampala City Council Authority Executive Director Jennifer Musis asked the former Mayor to vacate the premises on grounds that he acquired the house illegally. Ssebagala who was locked up in an over a one hour meeting with Kampala Metropolitan Police Chief Grace Turyagumanawe argued that Kampala City Council resolution allowed him to buy the house. However after the meeting he was convinced to leave the premises leaving behind his sons to negotiate with the Court Bailiffs amidst confusion as some of his supporters threatened to beat journalists that were covering the eviction. During the second last council which Ssebagala chaired as Mayor, the councillors passed a unanimous resolution giving the house to Ssebagala which the current city administration refused, insisting that he took over the house illegally. Part of his property has been transported on a truck reg. No. LG 0330-01 after he was driven away in a Black Toyota UAM 594J amidst tight security. Anti-riot Police reamined heavily deployed at the premises. 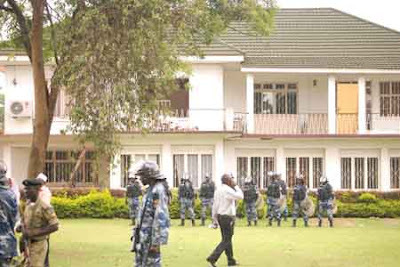 A combined force of police and the Kampala City law enforcement officers have today Monday used force to break into the town clerk’s residence to evict former mayor, Nasser Ssebagala. According to police, over 50 supporters of Ssebagala gathered at the residence armed with nails, hammers, stones and three 5-litre jerricans of petrol. The angry supporters were reportedly threatening to attack whoever tried to evict Ssebagala. On Friday, Police deployed heavily at the house located on Plot 1 Ssezibwa as Ssebagala was being evicted. Kampala executive director, Jennifer Semakula Musisi later told the Kampala Capital City Authority (KCCA) council that the former mayor had indeed been evicted and the keys to the house were with Grace Turyagumanawe, the Kampala Metropolitan police commander. But it turned out that Turyagumanawe was given old keys as Ssebagala had already replaced all the doors and padlocks in the house, as part of renovations. Turyagumanawe, who led the eviction exercise this morning, told reporters that police disarmed Ssebagala’s supporters before locking the former mayor in a garage with instructions not to communicate with anyone outside. At around 11:30am the KCCA law enforcement officers led by Vincent Katungi began to carry files, computers and other office items out of the house into the compound in the middle of a heavy downpour. The items were later transported to City Hall. George Agaba, the deputy director of physical planning at KCCA, says the furniture from the house will be taken to the city stores until new directives are given. Ssebagala insists he is the rightful owner of the property at the heart of conflict between him and the new KCCA leadership. He says he has spent up to 175 million shillings on renovations and that this money has accumulated to over 400 million shillings. The former mayor says the house was valued at 4.6 billion shillings by Kampala City Council officials and that he paid cash deposit of 30 million shillings. 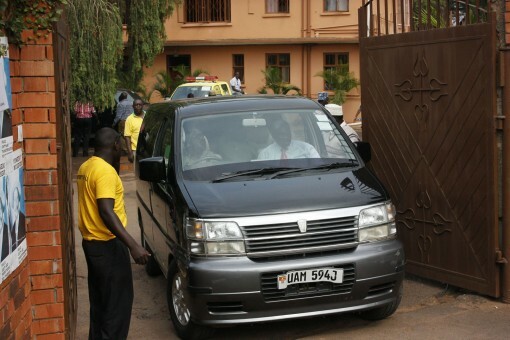 Police Surrounds Ssebagala’s Home As KCCA Moves To Evict Him! Kampala Capital City Authority (KCCA) law enforcement officers have moved-in to evict the former Kampala mayor from the property. Ssebaggala has been living in the house located on Plot One Ssezibwa Road in Nakasero, which was the official residence for the town clerk of Kampala. The property has been at the centre of a dispute between Kampala Capital City Authority and Ssebaggala. Kampala Metropolitan Police chiefs, Grace Turyagumanawe and Moses Kafeero are reportedly locked up in a meeting with Ssebagala inside the house. Ssebagala says between April 2008 and January 2010 he wrote to local government minister Adolf Mwesige and his predecessor, Maj. Gen. Kahinda Otafiire and that the two ministers gave him a go ahead to possess the property. He adds that on August 20th 2010 he wrote to President Yoweri Museveni over the issue and that the president responded in the same month authorizing him to take over the house. While Ssebagala admits that Museveni raised concerns about the illegal sale of KCCA property, the president reportedly said the Sezibwa house was an exception. Ssebagala early this month handed over office to his successor Erias Lukwago but refused to surrender Ssezibiwa house saying that he legally acquired it when KCC decided to dispose off some of its properties. This didn’t go down well with Lukwago who asked Ssebagala to surrender Ssezibwa house and make a fresh application expressing his interest to buy the house. Jennifer Musisi, the KCCA Executive director said that Ssebagala does not qualify to be a sitting tenant of Ssezibwa house because he was receiving a monthly housing allowances of shillings 2.5 million from KCC. WHO WILL TAKE UGANDA TO THE PROMISED LAND? When President Museveni's NRM/A took power in 1986 by force of arms, many people in Uganda thought that at last a 'saviour' had come on to the scene. 25 years down the road many with eyes and ears are sure that Museveni was not meant to take country to the Promised Land but had managed to take many on his bandwagon and a good number are regretting. This makes us reflect on the children of Israel who took a whole 40 years to get to the Promised Land. May be God is still taking Ugandans through hardships and those who endure will surely get there. It is so sad that to some people the situation in Uganda is comparable to when Daniel was thrown into the Lion's Den - the infrastructure by the NRM Government is almost like the Lion's Den, there are some people who are 'eating' Ugandans like Lion's would. It is just trust in God that He can take us through. The Israelites had moved about in the desert forty years until all the men who were of military age when they left Egypt had died, since they had not obeyed the LORD. For the LORD had sworn to them that they would not see the land that he had solemnly promised their fathers to give us, a land flowing with milk and honey. a. As an example of service and commitment in our "golden years"
c. Praying on his knees (a common posture for prayer) - cf. b. Whom Daniel had served "continually"
2. As often happens, those who set the trap get caught in it! 2. Another pagan king comes to realize Who is really in control! rather than men (cf. Ac 5:29)! 69 Ministers, 327 Members of Parliament, 278 political appointees who include 80 resident District Commissioners and assistants, 75 presidential advisors and 43 private presidential secretaries and their deputies is just a picture of Uganda’s public administration. Pearl of Africa as commonly known is argued that not only is it a sleeping giant but an over governed and unproductive country. It has many administrative units; 45,000 local councils, 5500 parishes, 1026 sub-counties, 151 counties, 18 municipalities and 80 districts. All these structures have executive 10 man executive officials. So, the total number of officials is 10 times the number of every administrative unit. How does this nation manage its servants? Uganda’s expenditure is very enormous and abnormal. A presidential advisor and his deputy earns 908.5 million Ugandan shillings enough to pay 378 primary school teachers a salary of 200,000 Ugandan shillings a month. Private presidential secretary and his assistant earn 7.5 billion shillings enough to; support 2,077 primary schools with 800 pupils each, buy drugs for 890 health centers, construct 935 classrooms or pay 37,500 primary school teachers. Members of Parliament altogether earn 57 billion excluding the allowances, the 69 ministers have all sorts of allowances and only government expenditure on Ministers vehicles fuel, oil and maintenance in 2006/07 was 92 billion Ugandan shillings. In 1986, the National Resistance Movement came to power, it collected 84 billion as revenue. Inflation was at 240 percent, it worked tirelessly and revived the economy reducing inflation to 0.3 percent. The present government collects 4 trillion as revenue but sectors like education and health and education which used to be vibrant are in shambles. The nation has 31 million people, according to the ministry of health, there’s one doctor to every 300,000 people. Surprisingly, there’s one administrative leader to every 6 Ugandan. The nation has poor administrative structures, poor administration and provides poor services to its citizens. The government makes good policies but it’s very hard for them to be implemented leading all these deficiencies. Policies like: decentralization policy to help distribute resources evenly; minimum health package which puts all health centers under a structured organization; Medium Term Expenditure Framework that makes the government budget and expenditure known after every 3 years. Such good and efficient policies have been made by the government but 600 billion Ugandan shillings is lost every year. The main reason why such policies cannot be implemented is due to the government’s huge expenditure to its top leaders and poor wages paid to its civil servants. This has led to absenteeism, lack of morale as the public servants do other jobs beside their jobs to supplement their earnings. It’s arguably that the nation has produced one of the brightest people in the East Africa region with the prestigious Makerere University but has the lowest productivity in the region. This is because Ugandans are juggling too many sources of income hence cannot specialize and put all their effort in one to enable them get sufficient income. The country also has a culture of passing laws to solve problems, this has led to it having too many laws and continuing to pass others yet the ones present are neither effective nor implementable. For instance, it has failed to implement the traffic and productive law yet it has passed a law to gag the media, limiting public participation in governance and locking up journalists with dissenting views. Pundits say that for the country to develop, it needs to reduce its administrative leaders, get more serious in enforcing its policies and laws. The administration is the main cause of the government’s huge expenditure, leading to lack of funds in other sectors and poverty. The country needs to be serious in economic transformation and development by getting its priorities right. Civil society, donors, private sector experts and political analysts have raised numerous concerns over the governments expenditure on its administration but their pleas have fallen on deaf ears. The country not only needs a budget discipline but get their priorities right. TOUGH TIMES: Unable to pay rent, Ramathan has moved to live with his aunt Khadija’s (left) in Kansanga, a Kampala suburb. PHOTOS BY FLAVIA LANYERO. When I run the message from Monitor regarding Ramadhan on my blog, little did I know that through that communication, a good Samaritan would help. I thank God very much for that. Below is the evidence. Please cross check and make sure he is the legitimate recipient. When two brothers decided to sit at the front of the packed Ethiopian Village Restaurant on July 11, 2010, they anticipated thrilling football action. That was never to happen. Instead, one died and the other today lives with a dislocated hip and damaged ear drum. Our reporter Flavia Lanyero, tells the story. The excitement was fever pitch. It was the game everyone was waiting for, a Spain-Holland football World Cup final. A few minutes before the game began, Muzamil Ramathan and his brother Siraji Abiriga, squeezed their way to the front of the giant screen at the Ethiopian Village Restaurant in Kabalagala, Kampala. It was not their habit to watch football out of home. But on July 11, 2010, the D-Day, their neighbourhood, Kansanga, a Kampala suburb, suffered load-shedding. There was no way they were going to miss this once-in-a-lifetime event. When the duo got to the restaurant, it was packed to capacity—and as they contemplated moving to another venue, Abiriga spotted a free plastic chair. He grabbed it and the siblings managed to push their way to the front—next to the screen. The chair could only sit Abiriga, so Ramathan had to make-do with the floor—sandwiched between his brother’s legs. But from that point, Ramathan does not recall what exactly happened. Whereas he knows the crowd was cheerful, he only remembers waking up in a stupor. “It was like I was dozing,” says Ramathan. “I woke up and found myself lying on my brother’s chest. I did not know that he was dead, neither did I realise that I had injured myself. Everyone was on the floor, thick smoke was going up.” It was clear that Abiriga had shielded Ramathan from shrapnel. The journey after that has been long and tortuous. He was rushed to International Hospital Kampala, where he spent the next three weeks—being treated for a dislocated hip. He has a metal running from his hip to knee, to try and get his thigh bone back into normal position. The metal, doctors say, will be removed after two years. Ramathan has a year left to the operation. But whereas he might count himself lucky, emerging alive in an attack that left 15 football lovers dead at the restaurant, including his brother who was also his benefactor, Ramathan has had to contend with numerous operations. The last was as recent as a month ago when metallic fragments were removed from his intestines. The government had already cleared the immediate bills and if my ear was to be fixed, I had to foot the bills, says Ramathan. He has never found the money—and now has to contend with the slow but painful reality that he is losing his hearing sense. But if losing a brother, fracturing a leg and suffering hearing problems were a test on his resolve, the final straw that killed Ramathan’s spirit was when he walked to his employer—a publisher on Uganda House in Kampala—who told him he was unfit to work there. He was fired. With the cost of living sky-rocketing and diminishing means of survival, Ramathan recently relocated to his aunt’s home in the same Kasanga neighbourhood, about five kilometres from the city centre. It is from here that he walks to the city centre daily in search of a job. The aunt, Nalongo Khadija, thinks the government should do more. “We have unemployment biting hard. The world would be a better place if the government looked at its own people,” she said. “Whenever people call for forgiveness of the killers, I feel bad. I want the al-Shabaab annihilated. I am willing to join the Ugandan army and go to Somalia just to have my share of revenge against the terrorists.” The militant Islamic outfit based in Somalia claimed responsibility for the attacks that in total killed 76 people and left hundreds injured. Back to Ramathan, the anger is visible on his face. He, however, is not alone. There is good reason why payments for the dead are handled by the Administrator General's office. May be the Government wanted political capital out of these payments, it is coming out clearly that may be in some cases, the right beneficiaries to the bomb deaths are not the one's who got the money. The Bukedde Newspaper stort below is evidence. The deceased Aminah Nakaggwa was wife to Ali Mubiru. Mubiru is a disabled man who travels in a wheel chair. He was forced to take their two children to their grand parent as he had no means to fend for them. Mubiru has gone to the extent of appealing to be helped out of his hopelessness now. This is good evidence that other parties got the shs 5 million and poor man was left in the cold. This should be revisited, and Government should take serious organs in place meant to handle specific roles/duties. 76 people were killed by the bombs at Kyadondo Rugby Club and the Ethiopian Village Restaurant during open-air screenings of the final match of the football world cup. Close to 60 others were hospitalized with a range of injuries. A statement released by Tarsis Kabwegyere the Minister for Relief, Disaster Preparedness and Refugees says the ministries of health and internal affairs are processing documents on the names and contacts of the next of kin of the dead. It says the money will be delivered to each family by the Permanent Secretary in the Ministry of Internal Affairs. The statement does not specify whether the same amount of money will be paid to foreign nationals who died in the attacks. It also does not give a timeline for payment. The Cabinet this morning also approved the payment of money to meet costs of treatment for hospitalized victims of the bomb attacks. Each person will receive three million shillings for the medical expenses. This brings the total cost approved to about 560 million shillings. Cabinet announces that national prayers for the victims will be held between Friday July 16th and Sunday July 18th to allow all religious denominations to meet on their days of worship. [Aminah Nakaggwa] MU baafiira mu bbomu z’e Lugogo nga July 11 mwe muli ne Aminah Nakaggwa eyaleka abaana babiri ne bba omulema. Ebya Katonda bizibu, kuba musajjawattu Ali Mubiru (30) n’abaana ababiri, yamulanga ki okutwala mukyala we eyali abayamba mu buli kimu! “Singa mukyala wange yampuliriza n’atagenda Lugogo osanga ensi singa tennyiga bweti,” bwe yatandise ng’ayunguka n’amaziga. Agamba nti Aminah bwe yamusaba okugenda okulaba omupiira yamugaana. “Yasala olukujjukujju n’annimba nti aliko w’agenda okunona ssente, nnalabira awo nga takomyewo. Aminah nnamuwasa mu 2001 nga tuli Masuuliita gye nnali nkolera engatto. Mu 2007 ssente bwe zaatuggwaako, bizinensi yange n’esaanawo, twasengukira e Kibuli era eno mukyala wange gye yava okugenda e Lugogo. Bwe twatuuka e Kibuli ne mpangira mukyala wange omudaala n’atandika okutunda ennyaanya, apo, wootameroni n’ebirala. Muno mwe tubadde tuggya ezitubeezaawo n’okulabira abaana baffe Shakirah Nabunnya (5) ne Hajara Birungi (2). Nange natandika okutunga engatto. Ku lunaku bbomu lwe zaamutta, nnali ndi ku muzigiti e Kibuli, Aminah n’ajja n’ansaba okugendako mu kapiira kubanga yali akanyumirwa nnyo. Naye omutima gwange gwagaana ne mmugaana okugenda. Nze nnamuwa ensonga nti abaana baali bajja muntawaanya nnyo engeri gye byali eby’okuggwa ekiro. Waayitawo essaawa ng’emu n’akomawo n’ang’amba nga bwe yali ayagala okugenda e Nakawa ew’omukyala eyali atera okumuguza ebintu bye yatundanga ku mudaala nti yali amukubidde essimu nti agende ebinone. Ssaamuwakanya kubanga bizinensi ye yali etuyimirizaawo era bwatyo n’agenda. Nze ku muzigiti nnavaayo ne nzira eka ndabirire abaana okutuusa nga nnyaabwe akomyewo. Wabula nalinda Aminah nga tadda, zaawera essaawa 2:00 ez’ekiro zaatawezangako ng’ali bweru omutima ne gutandika okunkuba. Nneebuuza oba afunye obuzibu! Ekibi nga tetulina ssimu kw’oyinza kumukubira, nga tukozesa ya muliranwa. Muliranwa nnamubuuza oba omukyala amukubiddeko n’anziramu nti tannaba! Otulo twambula, esaawa zaali ziwera musanvu ogw’ekiro ne mpulira abantu aboogerera ebweru nti bbomu zisse abantu Mukwano gwa mukyala wange omu ye yakantema nga Aminah bwe yali annimbye era yali agenze Lugogo. Nze amagezi ganzigwamu! Wabula nasigala n’essuubi nti Aminah anaakomawo. Obudde bwe bwakya nga tannadda ne nkakasa nti naye yali akubiddwa bbomu. Nafuna owa bodaboda n’antwalako e Lugogo wabula ssaasobola kulaba ku mulambo gwa mukyala wange kubanga twagenda okutuuka ng’aba poliisi n’amagye basibyewo akaguwa nga tebatukkiriza kuyingirayo. Nategeeza ab’ewaabwe ne bajja, oluvannyuma ne tugenda e Mulago mu ggwanika era ne bamutwala ne bamuziika e Ssemuto mu Bulemeezi. Olw’okuba Aminah yandekera ensisi, ennyumba yannema okubeeramu ate nga ne ssente ezirabirira abaana siziraba kubanga yali agenze ne kapito okusuubula ebintu. Embeera bwe yannemerera nasalawo okutwala abaana bange ewa jjajjaabwe e Ggobero. Kati mpangisa Sseguku, embeera mbi nnyo kubanga olumu ssente zimbula ate nga n’abaana bange beetaaga obuyambi. Enyumba mwe nsula ngisasula 30,000/- buli mwezi. Basiraamu bannange e Katwe be babadde bakyampaniridde wabula embeera eno mpulira ennyiye. Nsaba omuzirakisa yenna asobola okumpa ssente z’entandikwa azimpe nsobole okutandikawo ekkolero ly’engatto kubanga gwe mulimu gwe nnasomerera mu ttendekero e Nkokonjeru. Kuba ku ssimu ya mukwano gwange Haruna Kakaire 0784504818. I know of a youth who has run a cafe since 2007, but the costs of doing business are forcing him to go for odd jobs to Dubai. It is really sad, but Government ought to be aware of this only that positive response to making business easier is failing. One has to pay rents, electricity bills which many people find on the high, the power is erratic, you are off anytime when you least expected. Until Government gets the cost of doing business in the right focus, even those who wish to borrow to do business will fall out as their predecessors. The way to go is to address the cost of electricity, the taxes more so the VAT which is on the high, the cost of transport just to mention a few, not forgetting the currency which keeps depreciating. If the cost of doing business is not addressed, chances that the borrowers either default or get out of business shortly cannot be ruled out. The business communities have expressed concern on the high cost of doing business in Uganda. Speaking at the Presidential round table, the chairman Uganda investment Authority, Patrick Bitatule said they are faced with a number of challenges such as the cost of registering the business infrastructure, electricity bills, water among others. He says although Uganda has implemented some reforms on the same, there was need for more to be done to reduce the cost of doing business in Uganda. To this president Yoweri Museveni responded by promising to improve the business atmosphere in the next five years that will include construction of more transport routes leading to Sudan and working on the railway transport. He also promised that his government will improve power supply in the country when Bujagali dam and kruma falls dam are completed. DOING BUSINESS IN UGANDA. WHICH CONSTRAINTS? As we move into the post election period, we must now turn our focus to how we are going to navigate the arduous channels of doing business in Uganda over the next five years. Many Ugandans spend a lot of their time politicking or complaining. While they are complaining, there is a growing number of locals who have realized that this is the environment in which we have to live. As a result, they have turned their attention to doing business and indeed quite a number of these practical minded local investors are beginning to do very well for themselves. Be it in real estate, hospitality, trade and commerce, there is emerging a class of Ugandans, unaided by the state, who have taken the bull by their horns. What are they doing right in order to succeed? That ‘despite improvements over the past years, the adequacy of electric power supply continues to be a problem, for example, enterprises suffered 39 days without power in 2003and anecdotal evidence suggests that this number may not have improved in the recent past’. That according to the African Economic Outlook reportand based on information from the Ministry of Works, the quality of the national roads in Uganda is rated as follows: just 20% are rated “good”, 62% are “fair” and 18% are “poor. That by the end of 2007, Uganda had more than 4.7 million mobile telephone subscribers according to the Uganda Communications Commission (UCC). Fixed lines increased from 137,000 to 190,000 and the tele-density is at 16.5%16. Despite this, the use of the internet and personal computers - also indicators of technological readiness – is still low and costly in part because of the few internet service providers, the low literacy rate and limited availability of electricity. That the ‘the cost of finance is prohibitive. Locally owned firms tend to have less access than foreign-owned and that firms lack sufficient collateral/securities and information’. And so the story goes (see box 1). But despite this received wisdom from bureaucrats and academia; the facts on the ground appear to show that business is thriving and many entrepreneurs have learnt ‘to fly without perching’. So what are they doing differently in order to achieve the success that they are achieving? Constraints to doing business in Uganda: a litany of excuses? Uganda has been experiencing a reasonable degree of stability over the last 20 years or so, especially in the south of the country. If you look closely at the successful business operators today, you will find that they have been doing business over the last 20 or so years, and they kept to business. Recall that BMK used to import spares on Jinja road, having grown out of a small business in Ndeeba and Bwaise. KarimHirji used to sell ‘joolas’ along Luwum Street and SudhirRuparelia used to vend ‘soft drinks’. There are a lot of other successful entrepreneurs who have grown to be multi millionaires in true dollar terms, but they didn’t happen over night. They worked hard, invested, increased the number of business lines and prospered. Omar Mandela sold spares along Ben Kiwanuka, Godfrey Lule (Ntake) had a small bakery in Najjjanakumbi, and so on. If you look in the public sector there are also people who didn’t complain. They did their bit and caused a lot of structural changes. 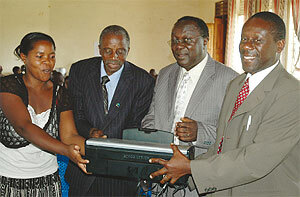 WaswaBalunywa and his ‘young proteges’ introduced private programmes in Makerere. The Professors who used to wear bathroom slippers to class turned against them and proclaimed ‘Look! They don’t have PhDs! Universities are not run like that. 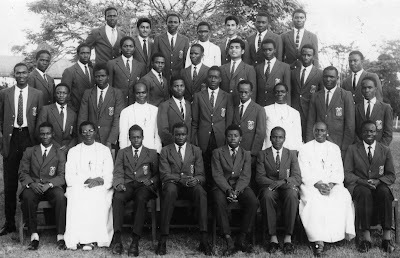 Blahblahblah!” Soon all of Makerere was running private programmes including stealing some of whatBalunywa had pioneered. Makerere would never be the same again. Others complained, from the comfort of Europe and America, thateducation standards had fallen in Uganda. TumusiimeMutebile reformed Finance and moved on to Bank of Uganda. A series of serious minded commissioner generals and their lieutenants reformed the Uganda Revenue Authority and tax collection will never be the same. The truth is that the successful entrepreneurs who are changing this country didn’t look at the constraints, they rode the wave to success and they have prospered. Over time, their garden has flourished because they stuck to the chase. The rest of us, well – there was a ‘disenabling’ environment. This negative attitude and politicking has negatively affected our attitude to success and many of us didn’t succeed, or will not succeed in this life! 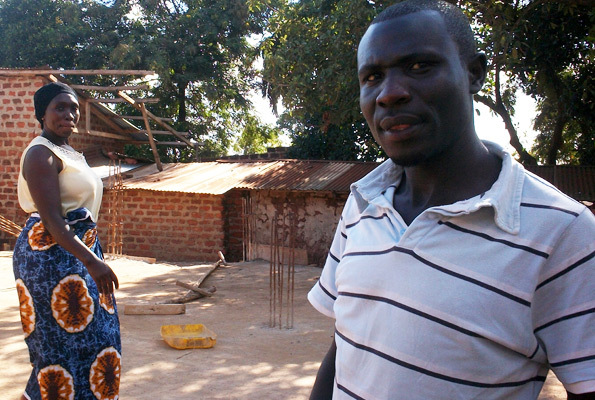 Because Uganda was an awakening giant, there were a myriad opportunities for those who dared. Today, there still are if you can see the forest for the trees. In those days gone by you needed Resistance (now local) Council approval to get a fixed phone line or water connection or electricity. You needed an authority letter to get foreign exchange or passport. The government liberalized these things and well, today we have telecom and electrification millionaires. There were opportunities galore. In trade, finance, agriculture and industry. Aha…Mukwano was also selling ‘joolas’ along Luwum Street in the 1980’s. Today I am sure very few of the people who used to frequent his shop could even get to see him. He is semi retired and lives in the benign region of Tooro. These opportunities haven’t gone away. The population has grown two and half times and the regional markets of South Sudan and Congo are just opening up. Just you wait until the oil boom starts! For those of you who are still politicking, sorry, the train left the station 20 years ago but you can still jump on. Uganda is a land of opportunities and you don’t have to piggyback on the NRM government, or any other government for that matter, especially if you don’t like politics! The era of Big Society is here! It doesn’t matter if you go east or west. Communism is dead. Period. China is up and running, India is on the move and Russia is thick with billionaires. The only thing that will matter tomorrow is whether one is a threat to business interests or not. This is the era of Big Society if you don’t know it. First espoused by the conservatives in the UK in 2010, Big Society may be the next big thing. The aim is “to create a climate that empowers local people and communities, building a big society that will ‘take power away from politicians and give it to people’It is an an impressive attempt to reframe the role of government and unleash entrepreneurial spirit. This new ideological order means that the future belongs to those who take the bit in their mouth and do something about their situation. The winds blowing from North Africa portend the dearth of dictatorship, and the era of the entrepreneurial society. The era of Big society means that governments must become more transparent. There will be more people power, and more devolutionism. So who shall we blame for constraints to business? It is time to be positive, forget who is in charge at the national level and what they are not doing, and take a hold of your destiny. Listed below is a detailed summary of the bureaucratic and legal hurdles an entrepreneur must overcome in order to incorporate and register a new firm, along with their associated time and set-up costs. It examines the procedures, time and cost involved in launching a commercial or industrial firm with up to 50 employees and start-up capital of 10 times the economy's per-capita gross national income (GNI). The information appearing on this page was collected as part of the Doing Business project, which measures and compares regulations relevant to the life cycle of a small- to medium-sized domestic business in 183 economies. The most recent round of data collection for the project was completed in June 2010. To see indicator data for all economies, see the Starting a Business page. To see how economies rank, see the Rankings page. To reserve a company name, the founder files a company name reservation request at the Office of the Registrar. A clerk conducts an automated search and forwards the application to a staff lawyer. The Registrar reviews the application and, if the application is approved, returns it with the assessment, which the founder takes to the bank. Upon paying the fee ( USH 10,000 for name search & USH 15,000 for name reservation), the founder receives a receipt that is used to complete the name reservation. All nontax payments to government agencies must be made at a bank. - Statement of nominal capital: UGX 500. - Declaration of compliance with the requirements of the Companies Act: UGX 500. - Particulars of directors and secretaries: UGX 700. - Consent to act as director of company: UGX 500. - Notice of situation of the registered office and the registered post address: UGX 500. Form A2, Declaration of compliance with the requirements of the Companies Act, must be commissioned (signed and sealed) before a commissioner for oaths, who is an advocate. The other documents can be witnessed by any other reputable person because they are not an oath. The fees range from UGX 2,000 to UGX 10,000. Computerized processes reduced the time frame for paying government levies, such as fees for licenses and certificates. The process requires only 30 minutes, down from 4 working days. Registration receipts are obtained from the bank where the fees were paid (within 30–40 minutes). Previously, the founder would pay the fee at the bank and then wait for 3 days to pick up the receipts from the Ministry of Justice. Registration is administrative process through the creation of the Uganda Registration Services Bureau, which is autonomous from the Ministry of Justice and handles all business registration–related issues. - Stamp duty: 0.5 % of shared capital. - Stamp duty on Articles of Association: UGX 35,000 ( flat fee). Registration fees depend on the amount of share capital. They increase as the share capital increases. For instance, the fee for share capital UGX 5 million is UGX 160,000, and for share capital 10 million, UGX 186,000. Registration fees for a company whose share capital does not exceed UGX 40,000 has been increased to UGX 100,000. The current threshold for VAT is only for businesses with annual returns of UGX 50 million and above. However, if a company’s quarterly returns amount to USH 12.5 million and above, it should register for VAT. Only registered income tax payers may apply for VAT. An inspector from the Uganda Revenue Authority must inspect the business premises before a VAT certificate is issued. The pay-as-you-earn (PAYE) tax is paid by the employee but collected by the employer. This tax comes into effect later, upon the company becoming operational. Rates are applied depending on the employee’s yearly income; for instance, Employees earning below 1,560,000 do not pay PAYE, 10% is taxed on incomes exceeding UGX 1.56 million but not exceeding UGX 2,820,000. The amount increases as the income increases. For ease of distribution of trading licenses, a decentralized system has been set up in which the 5 companies were appointed to collect dues on behalf of Kampala City Council (KCC) for each of the city’s five administrative divisions. Currently, the services of these companies have been suspended as the city council is conducting assessment to decide on the adequate license fees before contracting the companies again. 14 The licensing officer arranges an inspection of the premises and fills out an assessment form. The trading license is a general business license required for all companies, including service companies. The issuing authority is the municipal authority in the jurisdiction where the business premises are situated. A trading license can be obtained almost instantly, if the necessary documents on the nature of the intended business activities are available and the amount is assessed by the municipality or city council. Standard forms must be completed and submitted with the memorandum and articles of association and the certificate of incorporation. 15 Pay the license fee at the bank. - Opening office: UGX 156,500. - Carrying out retail business: UGX 206,500. - Carrying out wholesale business: UGX 366,500. If it is deemed necessary, the municipal inspectors (health and building) reserve the right to revoke and cancel the trading license. 17 File a form with the National Social Security Fund (NSSF). The National Social Security Fund (NSSF) is governed by the revised laws of Uganda, the National Social Security Fund Act Cap 222. The NSSF is a compulsory saving scheme that covers all employees in the private sector, including nongovernmental organizations and parastatal bodies that are not covered by the government pension scheme. Under the Act, every employer must register the company with the NSSF when it has 5 or more employees and all employees ages 16–35 as NSSF members. This procedure takes 1–7 days. Registration forms for NSSF can now be downloaded from the NSSF website. A company seal is mandatory. IS UGANDA AS A COUNTRY SECURE GIVEN THE UNRELENTING GOVERNMENT SPENDING PRESSURES? A new report by the Auditor General shows that the country’s capital reserves in Bank of Uganda have declined by 48 per cent due to the bank’s rising expenses and unrelenting government spending pressures. Mr John Muwanga has noted in his latest report that various government accounts held in Bank of Uganda were also overdrawn to a tune of Shs3.188 trillion through unexplained circumstances and without the authority from Minister of Finance contrary to the Public Finance and Accountability Act. The new report further shows that the Bank’s capital reserves, including unutilised foreign exchange gains reduced from Shs1,080 trillion to Shs1,046 trillion. At the same time, Bank of Uganda’s expenses have also increased from Shs138 billion for the year ended June 2009 to Shs204 billion as of June 2010. The latest AG report to Parliament comes after the Bank of Uganda Governor, Mr Emmanuel Tumusiime-Mutebile, told the Financial Times newspaper that he had disagreed with Mr Museveni over the decision to spend $740 million on jet fighters, which has pushed reserves down from six to four months of import cover. “He gave me some promises which he has not kept – like a way to redress the reserves,” Mr Mutebile told the FT recently. Already under pressure to deal with the double-digit inflation- currently standing at 17 per cent and the depreciation of the shilling, the Auditor General said Bank of Uganda has suffered from cash flow problems partly due to effects of the global financial crisis. For example, interest income has significantly decreased from Shs114 billion for the year ended June 2009 to only Shs38 billion in June 2010, representing a decrease of over 67 per cent. The revelation is, however, likely to affect the Bank’s efforts to ease the depreciation of the shilling and inflationary pressures on the economy. When contacted yesterday, Mr Elliot Mwebya, the director communications Bank of Uganda, said he had not yet read the Auditor General’s findings and promised to get back to this newspaper after reading the report. In the recent past, however, BoU management has said they were considering ways and means of enhancing the Bank’s income and controlling expenditure. However, they said they were constrained by the low interest rates still prevailing in the international markets. Bank of Uganda said the Accountant General promised to resolve the controversies surrounding all the government’s overdrawn accounts. Mr Muwanga also asked BoU to recover $11 million from city businessman Hassan Basajjabalaba or demand the money from the government, the guarantor of the loan to Hides & Skins Ltd, a private company. In 2003, the government undertook to pay the money in the event that the company fails to repay the loan. World Bank Country Director John Murray McIntire who flew into Uganda on January 12 landed right into the middle of a perfect storm brewing between the government on one hand and donors and the World Bank otherwise called `development partners’ on the other. Donors are apparently concerned about the implications on the economy of the many financial pledges, commitments, and policy changes that President Yoweri Museveni is spewing out in the heat of his campaign. The donors held a heated meeting with finance ministry bureaucrats on Wednesday January 13 at the ministry of Finance offices in Kampala. One of the most contested issues was the recent Shs 600 billion `emergency’ supplementary budgets approved by a special sitting of parliament on Jan.4 for various government departments. Nobody at the World Bank office and the donor community in Kampala is speaking on the record yet because the donors are carrying out an internal analysis of the implications of Museveni’s spending bonanza. They are also preparing a statement on a joint position. The statement will include steps they intend to take if Museveni does not adequately explain what they are terming “budget indiscipline”. Reviewing or even a suspension of donor/World Bank budget support to Uganda is on the cards, The Independent has been told on condition of anonymity and in several separate interviews by officials on the development partners side. “This is a defining moment for the relationship between the government and the donors,” one source said. The donors are also concerned about such off-budget activity as the recent purchase of six SU-30 MK2 fighter jets from Russia by the government. Each of them is valued at approximately U600 million (Approx. Shs 1.3 trillion). According to the source, financial analysis indicates that the off-budget expenditure in the Ministry of Defense alone is about 3.2 percent of the national budget which is equivalent to the budget allocation to the ministry of Agriculture. This is dangerous and unsustainable, the source said. But the donors have internal problems as well. To arrive at a joint position, they need to overcome indifference from German’s GTZ, and American and British fixation with using budget-support to poor countries as a means of retaining influence, most especially on security matters. [President Museveni hands out an envelope to a resident of Kalanga village in Buyende district on 22-8-2010 on his tour of Busoga Sub Region in August last year Independent/PPU PHOTO] Already, there are holes in the donors’ group. GTZ (which since Jan.1 is operating as GIZ after merging with DED and Inwent), the Americans and the British have already indicated they will continue offering support under whatever aperture of opportunity is offered by the government. That leaves only the World Bank, IMF and the European Union as the only parties determined to press the point of budget discipline. what they can expect from the government. Usually the Permanent Secretary Ministry of Finance and Secretary to the Treasury, Chris Kassami, who is the government’s points man in dealing with development partners favors the posture of a taciturn with his wrinkled ashen face giving away little behind his bifocal glasses. At last week’s meeting, sources say, he adopted exactly this posture as a band of development partner representatives berated him over the perceived spending binge by Museveni. “We are very angry,” one of them said to an emotionless Kassami, “we are going to cut budget support 100 percent.” Usually, during such beratings, Kassami offers a defense of the government position. This time he did not. Donors are still wondering where the government is getting the arrogant attitude towards them, more so the ministry of Finance with which they have had a cordial working relationship. Some suspect that the expectations of oil revenues are changing Ugandan officials’ attitude towards donors. “For us this is an even bigger problem than the budget indiscipline,” one source told The Independent. Previously, whenever government departments requested for supplementary budgets, the money would be whittled off the allocation of other departments. This time it has not happened. Instead most departments either have a flat-budget without the year-on-year increment in allocation or have requested supplementary allocation. The donors are unsure but they say there are only two ways the government could be financing its spending binge. They say the government is either printing new currency or depleting the country’s national reserves at the Bank of Uganda. [Kundhavi Kadiresan] Both these positions, if the government adopted them, are highly dangerous to economic stability. Ugandans go to the polls on February 18 to elect the President and members of Parliament. Under the approved supplementary budgets, State House will get Shs 95 billion. Of this Shs 18.6 billion is for donations by President Museveni which have been criticized as `bribes’ during this campaign period. State House has defended them claiming that the President is not bribing voters but doing his job as president. State House had Shs 80.6 billion in the budget. That means its budget has shot up by 130 percent. The ministry of Defense will get Shs 89 billion, Shs 83 billion for the Electoral Commission, Shs 82 billion for police, Shs 37.7 billion for Ministry of Justice to compensate DURA Cement Ltd, Shs 5 billion for the Ministry of Security, Shs 8.4 billion for President’s office, Shs 5 billion for Bududa landslide victims, and Shs 891 for the office of the Inspector General of Government. The Independent broke the story of the request for supplementary budgets story in our December 17 issue under the title: `Museveni’s Shs 380bn campaign bonanza’. During debate in parliament, MPs mainly from the opposition, echoed claims that the supplementary budget requests are really designed to put money into Museveni’s campaign kitty. [Finance Minister Syda Bbumba] But NRM Secretary General and Ministry of Security, Amama Mbabazi dismissed the claims. Mbabazi’s ministry will get Shs 5 billion and from the Shs 8.4 billion for the Office of the President, the Internal Security Organisation and External Security Organisation, which Mbabazi controls, will take Shs 5.3 billion. The donors are concerned that government has promised to give every MP Shs 20 million purportedly to oversee the National Agricultural Advisory Services (NAADs) as constituency mobilization. Donors fund 80 percent of the US$ 108 million NAADS budget. They are also unhappy that a day after the supplementary budgets were passed, the NRM gave each of its MPs Shs 20 for the campaign. Then a few days later it unveiled a Shs 900 billion plan for the redevelopment of Kampala roads which is not in the budget. The donors see the allocations as open and blatant bribes to buy off the legislature. The donor community and government of Uganda have a standing agreement to “ring-fence” budgets for what donors call “poverty reduction expenditure areas” such as health, education and agricultural extension services. NAADs money falls under this category of priority budget areas that are not supposed to be cut of short-changed. Most money for these areas is actually not direct aid but savings from Uganda’s debt forgiveness by donors. It is money the Uganda government would otherwise have paid in debt service but is required to put in these priority areas under the terms of debt forgiveness. [Chris Kassami] Donors have in the past cut aid over NUSAF and NAADS over breaches of the agreement. Supplementary budgets are normal, but donors are questioning the volumes involved. Why would State House ask for a supplementary budget that is 150 percent more than its original budget, one donor official asked, especially in the middle of a campaign? This is obviously money meant for Museveni’s campaign. Charles Onyango-Obbo, the renowned journalist and commentator has spent over three decades analysing Uganda’s political economy. He told The Independent that oil revenues are, at least, another three years off. “That doesn’t seem to be a compelling explanation for Kassami/govt position. Also, I doubt that the donors would collapse their budget support during the election period - that would overly politicise their actions,” he said. However, he said Museveni’s spending binge reveals a lot about the elections and the premium that Museveni is putting on winning with less violence than in 2001 and 2006. “He will pay whatever bribe it takes to the voters,” Onyango-Obbo said. Donors, the World Bank and IMF have been great bed-fellows with government of Uganda since it adopted their preferred policy recommendations of Structural Adjustments, Stabilization, deregulation, privatization and liberalisation. However, the relationship has become rocky since the government started cutting down on donor dependence. According to The Independent’s Managing Editor, Andrew Mwenda, who has previously worked with the World Bank as a consultant on the political economy of donor-Uganda government relations, the relationship between these erstwhile allies may be difficult to sustain going forward. “Previously there was a convergence of different but compatible interests between the donors and the NRM government,” Mwenda says, “The NRM had inherited a collapsed state and economy. Yet to consolidate itself politically, it needed money – which only Western donors could give. On the other hand, donors wanted to produce an African success story through structural adjustment reforms – and many African governments were resisting. [President Museveni hands out a cash-stashed envelope to a Bishop] From this analysis, it seems over time the two sides became dependant on each other; and mutual dependence led to mutual vulnerability. However, over the years, many African countries have embraced these reforms and began to register sustained growth. So Uganda lost its position as the leading reformer and success story – and had increasingly been replaced by Ghana, Mozambique, Rwanda, Ethiopia, Mali, etc. On the other hand, sustained growth and expected oil revenues have also given Uganda potential access to increasing tax revenues and also higher expectations from oil. This has made the government more self reliant and therefore confident and even arrogant. Thus, the factors that had sustained this good relationship with donors seem to be dead or dying. Many observers fear the relationship could totally collapse when the government starts earning the much anticipated petrol dollars. They note, however, that there is a window of between seven to 10 years to when Uganda could actually starts pumping oil from the ground and donors will remain relevant during this time. For now, government of Uganda may try to assert its independence and sovereignty but not as much as to totally alienate donors. Many are keenly aware that Uganda does not actually have to wait until it starts pumping the oil to earn the oil dollars – it can sell the oil underground under futures’ contracts. These are financial arrangements that enable an entity to sell an asset at a specified future date at a price agreed today. However, Uganda will still need donors to part-finance either a refinery or a pipe line. It also needs them for its reputation in international financial markets where it may seek loans. Donors also know that in spite of NRM’s increasing patrimonial practices, the economy shows both robustness and growth momentum. Because of these factors, it is unnecessary for government and donors to cut off what has been a successful relationship. “The two sides may quarrel bitterly against each other,” a Makerere University don who is consulting for the government on a donor funded project and therefore requested anonymity told The Independent, “But they know that they still need each other. This is a marriage of convenience. The strategic objective of the donors is growth. Uganda government is keeping pro-growth policies on track. So donors are getting their strategic objective. How government allocates its budget is a tactical problem which donors should not make the principal source of conflict in their relations with government. President Museveni may be unfortunate as he is going to leave behind a legacy unprecedented when he finally retires from State House.It is sad to learn that during this age and time in the Banana republic of Uganda some people can open and operate ghost accounts to such magnitude as the KCCA is unearthing. The regime has simply be interested in seeing itself remain in power as the tax payer resources are stolen by those thieves majority of who sing NRM and President Museveni songs. It is very sad. KCCA it is hoped will not be frustrated by these thieves who are at times protected by Government. Six employees of the Kampala City Council are under arrest for alleged theft of funds and abuse of office. The arrests come as the Executive Director of the newly formed Kampala Capital City Authority Jennifer Musisi tries to end the pervasive corruption at the council. Speaking on the arrests, Musisi confirmed that more investigations were underway to recover council assets and funds stolen by staff. A special audit by the Kampala Capital City Authority (KCCA) has unearthed 12 ghost bank accounts managed by former divisions of Kampala. The accounts hold undeclared cash amounting to over sh20b. Preliminary audit findings reveal that the divisions were operating 132 bank accounts, and not 120 accounts declared in their handover reports. The accounts contain large sums of undeclared cash but the circumstances in which they were opened and operated are unclear. According to audit, the divisions collectively claimed to have a total of sh45.6b in the accounts at the time of handover. But the audit discovered sh52.2b, indicating an excess of over sh6.6b. The findings show that Nakawa division declared 17 bank accounts with sh5.3b. But it has been discovered that the division was operating 20 bank accounts with over sh7.4b, representing an excess of over sh2b. Lubaga division declared 15 bank accounts with sh3b, but the audit found 18 bank accounts with more than sh4b. Whereas City Hall reported that it had 28 bank accounts with sh23b, eight more bank accounts were discovered with over sh25b. A sum of sh175m was discovered from 19 bank accounts managed by Makindye division, yet it claimed to run 17 accounts with sh3.7b. An additional sh908m was also discovered by the audit but its source is still a mystery. Only the Central division was found to operate the 23 bank accounts that it reported, but an additional sh196m was unearthed on finding sh6.199b on the accounts, instead of the sh6b declared. Kampala chief executive officer Jennifer Musisi said the sh20b would be included in the budget for the financial year 2011/2012. KCCA council on Tuesday approved a sh174b budget, of which sh74b will be locally generated and sh101b provided by the Government as conditional grants. Kampala Lord Mayor Erias Lukwago said there had been massive fraud in KCC and these were just some of the things that were being investigated. He, however, appealed to the authority to allow the divisions to access their bank accounts, saying the decision to freeze the accounts was denying people access to basic services. Former Nakawa division chairman Protazio Kintu said he was not aware that the division was operating 20 bank accounts but advised the authority to put the town clerk to task to explain. “I declared what I was given,” he added. Efforts to reach other former division chairmen were futile as their phones were switched off. Last month, Musisi stopped all operations of the accounts of the five divisions of urban councils under the authority pending investigation. However, in an interview with New Vision, Musisi said since she was appointed, all powers were withdrawn from the division accounting officers, who were then town clerks and handed. Using the state and its resources has constituted a vital form of consolidating power for Africa’s rulers. However, donor-sponsored reforms have threatened to curtail the opportunities of African leaders to maintain their regimes in power. Donor reforms introduced under structural adjustment programmes have sought to reduce the size and scope of government as well as to cut state spending and thereby curb the possibilities of state patronage. Reforms have also attempted to contain corruption and improve state governance. In Uganda, however, the relationship between donors and the government has reproduced patronage government. The donors have hailed Uganda as a major case of economic success in Africa. They have provided it with large amounts of financial assistance to support the implementation of reforms. High levels of foreign aid have provided the government with public resources to sustain the patronage basis of the regime. Moreover, in a context where wide discretionary authority was conferred on governing elites in the implementation of reforms, public resources could be used in unaccountable and non-transparent ways to help the government maintain its political dominance. The donors have begun to realize belatedly that they have been propping up a corrupt government in Uganda. The Government of Uganda has to get serious with agricultural exports. The country is at a moment in time when the currency is badly depreciated and many are not sure whether the shilling will recover. The NRM Government has taken private enterprise too far to the extent of badly hurting the economy. There is news that the Coffee Sub – sector is promising, however, some farmers don’t have the slightest sense of quality and as such end up mixing mature coffee beans with those that are yet to mature and because individuals move around buying from these farmers, the quality of Uganda Coffee is badly compromised. The way Cooperative Stores built during the Obote II administration that have been diverted to other uses is one of those strategies that are regrettable. The Cooperatives infrastructure which was in place worked as a positive vehicle in the marketing of Coffee, but the privatization has simply messed up the situation. The way forward is for the Government of Uganda to wake up to the challenges of promotion of Coffee quality and that of other agricultural exports. Where Coffee is concerned, there is need to ensure that the farmers don’t harvest Coffee beans which are not mature. This is not easy and the 2nd challenge is how many farmers have no facilities for handling the drying of the Coffee beans. What Government can do is to get involved in collecting the Coffee shortly after harvesting. This can be done at collecting centres where the Coffee farmers could take the Coffee and it is examined to make sure that it does not have unripe beans. The Coffee would then be left at that centre from where it would be collected and taken to a drying centre. This being done to ensure that quality of Coffee is ensured. In this undertaking, the farmers previously complained about delayed payments, however, I am of the opinion that we are better placed to for example have Government put in place a mechanism where the farmers can get payment after delivery of the Coffee. This should all be done in the spirit that private players have played a big role in the devaluation of Uganda Coffee yet Coffee remains a key foreign exchange earner which Government needs to safe guard more so after the bitter experience the country has gone through of exporting devalued Coffee as a result of the negative role of the private players in the market. The Kaweri Plantation is the first large scale coffee plantation ever established in Uganda. So far, coffee has exclusively been produced by small farmers. Thus, the project has a high symbolic value, expressing itself for example in the fact that president Museveni personally commissioned the plantation on 24 August 2001, together with Michael Neumann, the head of the Neumann Kaffee Gruppe. n 2002, the plantation won the Uganda Investment Authority’s (UIA) “Silver Investor Award”.1 The plantation does in fact fit perfectly into the government’s strategy to promote export oriented economic growth with the help of foreign investors. Since the beginning of the 1990s, Uganda government pursued a strategy of neoliberal economic restructuring and privatisation according to the tenets of the “Washington Consensus” and in close co-operation with the International Monetary Fund (IMF) and the World Bank. In 1991, the Investment Code was passed and the UIA was founded in order to attract foreign direct investors to the country. “Poverty Eradication Action Plan” (PEAP), forming the basis of the state’s agricultural policy. The aim of the PMA is “poverty eradication through a profitable, competitive, sustainable and dynamic agricultural and agro-industrial sector”, which is to be achieved primarily through the conversion of subsistence into commercial agriculture. The government considers the Kaweri plantation to be a key project in this plan. Coffee exports from Uganda, Africa’s second-largest producer of the crop, may this month climb 13 percent from last year to 265,000 60-kilogram (132-pound) bags, according to the Uganda Coffee Development Authority. The forecast is 4.6 percent higher than the 253,270 bags exported last month, the authority official, who declined to be named because he isn’t authorized to speak to the press, wrote in an e-mail today. A secondary harvesting in the central and eastern regions, as well as the main crop in the western and southwestern regions has picked up momentum earlier than usual, according to the agency. Shipments in the 12 months through September may decline to 2.6 million 60-kilogram bags, from a Sept. 20 forecast of 3.1 million bags, the authority said on April 13. The revised forecast is 2.6 percent lower than 2.67 million bags exported last season, according to the authority. Exports from the start of the season on Oct. 1 through May declined to 1.75 million bags, from 1.78 million bags a year earlier, according to a tally of the agency figures by Bloomberg News. East Africa’s third-largest economy had a draught from December to April, which the government blamed on climate change. More than 95 percent of Uganda’s crop is grown by small- scale farmers whose crop is predominantly rain-fed, according to the authority. Uganda earned $243.6 million from the sales of the beans last season, down from $291.3 million a year earlier. Robusta beans, used in instant coffee, account for about 85 percent of the country’s annual coffee output. The country consumes less than 3 percent of its annual output, according to the Eastern African Fine Coffee Association. The East African nation plans to increase production to 4.5 million bags a season by 2015 through an ongoing replanting program, according to the agency. COFFEE farmers have called for government’s intervention to address the deteriorating coffee quality. The farmers, under their umbrella group, the Ankole Coffee Producers Co-operative Union, accused coffee dealers of tampering with quality through poor handling. They noted that Uganda’s coffee could lose value on the international market as a result, unless the Government enforces quality standards in the industry. The farmers accused dealers of using crude methods, especially during drying. They claim that some businessmen mix coffee with stones. The coffee farmers raised the concern at their 4th annual general meeting at Katungu Mothers Union hall in Bushenyi district on Friday. They (dealers) are not farmers. Therefore, their interest is only in making profits. We appeal to the Government to intervene because when Uganda’s coffee loses market, it is the farmers to suffer,” appealed Eliab Ngambe, the union’s chairperson. Ngambe said despite their efforts to organise farmers through reinstating co-operative societies, they were facing competition from the coffee dealers. He said the dealers use wreckless means to gain an upper hand in the coffee business. “Since our coffee is competing with other countries in the coffee business on the international market, the Government must enforce quality,” John Nuwagaba, the union’s general manager, said. The commissioner for co-operatives development, Fred Mwesigye, advised the farmers to mobilise themselves to increase production to have a firm foundation to negotiate for good prices globally. He said more farmers’ co-operative unions were needed as a measure to out-compete the coffee dealers. “Uganda’s coffee used to be top-rated compared to other countries’ coffee, but it is sometimes also rejected because its quality has declined,” Mwesigye noted. Nuwagaba pointed out that last season, the co-operative exported 700 tonnes of coffee, adding that they were targeting about 1,000 tonnes this season. Out of the 13 societies subscribing to the Ankole Coffee Producers Co-operative Union, Abateganda Co-operative Society in Ntungamo district, emerged the top contributor to the union, supplying over 73 tonnes of coffee last season. Meanwhile, Roselynn Karatsi reports that six factories have been closed in Kinoni in Masaka district for compromising coffee quality, according to the Uganda Coffee Development Authority (UCDA). The closed factories are Mbuga Coffee Factory, which was operating illegally and had no husk chamber. Namugera Coffee Millers and Kabayo Coffee Factory had dirty premises and were found drying coffee on bare ground. Others closed are Kiyemba House Coffee Factory, which was drying coffee on roadsides. Yamwe Coffee Factory had no husk chamber and was unhygienic, with an uncemented floor, while Kyabakuza Young Coffee Factory also had no husk chamber, according to UCDA field staff. The action has led to loss of millions of shillings, since a single factory processes approximately 3,000kg daily, according to Anthony Sembatya, the chairman of the Masaka Coffee Processors. He said, apart from hurting their businesses, it has affected workers. Sembatya argued that instead of closing the factories, UCDA should sensitise the farmers in villages about proper coffee handling and quality. According to UCDA regulations, buyers and dealers are prohibited from drying coffee on bare ground as it affects coffee quality. The media can be innovative. The articles run towards the 1st Anniversary of the July 11, 2010 Bomb blasts has put us in the right perspective more so of the shortcomings of our Government. It was surprising to see the Government of Uganda give shs 3,000,000 to each of the bomb victims. It is clear from the testimonies of some of the survivors that their treatment is on going. What the government could have done, which is not late to be done is to ensure that these victims and those in similar circumstances are attended to by a properly established medical organ. It is shocking that some of the bomb victims are in crisis over meeting the continued treatment needed to see them in better health. The Government should have given the shs 3,000,000 as a token to the victims and then committed itself to meet treatment costs of these victims individually. This is sad more so that as the Government of Uganda alleges that the Uganda involvement in Somalia is responsible is one other reason why Government should take on the responsibility of meeting the medical care, counseling and help to see them adjust into some payment ventures given their circumstances. In tomorrow’s paper, read about a street boy, who after weeks of saving, decided to spend his hard-earned money at Kyadondo Rugby Club. Little did he know, he was saving to spend on what would turn out to be a traumatising experience. 22nd June 2011 marks 15 years of Central Broadcasting Service (CBS) radio. The radio has grown from strength to strength over the years tempting the NRM administration to be tempted to see its strength and influence reduced, unfortunately, the cultural aspect has prevailed and the radio is strong and influential. Over the years, the presenters of the station have been an innovative lot and this innovation reached great heights in 2009 before the so – called Buganda riots which were induced by the Central Government miss advised move which saw the blocking of the Katikiiro of Buganda from going to Kayunga and eventually the refusal by the authorities that be that the King of Buganda does not travel to Kayunga. Through the 15 years the going has not been easy. 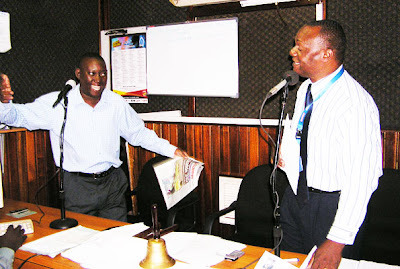 The people of Buganda were shocked to learn that the man who was behind the technical innovations which saw the radio on air (Peter Sematimba) shortly became a liability and it is no surprise that today he has his own station. This move was meant to see to the reduction of the radio strength, but God did not give the move the blessing. As if that was not enough, the same Sematimba came and stood for the Chairmanship of Lubaga Division, and given the division within the Democratic Party ranks, the unexpected happened. The man believed to have the backing from the powers the powers that have always wanted Mengo to be of less influence got into office and before Sematimba left to campaign for Lord Mayor ship he found it easy to tell the electorate how he had delivered for the people of Lubaga. The problem is not delivering or not, but the motive! Having a man who is a Muganda coming to see the people of Buganda turn attention from their King is unfortunate. The management of CBS Radio is hailed for innovations made which generate money which money helps many other innovations to move including the sponsoring of students as well as a number of other social responsibilities. This is at a time when the central Government has deliberately sat on rent dues accruing from the Buganda Government assets ‘rented’ by the Central Government, a move which is difficult to understand, but which move the Buganda Government has had to bear though a number of people from Buganda vote for the NRM Government leadership. That a part, the Central Government leadership has refused to grant or bless the federal arrangement which is cherished by over 60% of the people of Uganda according to the findings of the Odoki Commission. It makes sense to celebrate the 15 years less one dead year when the Central Government decided to close the station for a whole year. It is our hope that as the 16th year is started, the Central Government leadership will start seeing CBS Radio as a potential development partner and hence make positive support to the station instead of scheming to see it down. Saturday Monitor has learnt that a Cabinet meeting at State House Entebbe chaired by President Museveni on Thursday night agreed to temporarily allow the radio, taken off air 19 weeks ago, to resume broadcasting - subject to a dozen stiff provisos, among them an explicit apology to the government. The government has ordered the Central Broadcasting Station radio to immediately relocate from Bulange-Mengo, the seat of Buganda kingdom, and disassociate itself from the Kabaka if it wants to remain in business. Sources that attended the 9-hour meeting but whom we cannot name because Cabinet discussions are confidential, told this newspaper that a consensus was reached to permanently withdraw the station’s licence if the mangers do not toe the line preferred by the central government. Among the 12 conditions, which CBS Managing Director Kaaya Kavuma yesterday said they are yet to formally receive from the government, is a requirement for the radio managers to sack all employees accused of inciting the September 10-12 riots in and around Kampala. At least 27 people were allegedly shot dead by state security operatives as they violently quelled the civil unrest, ignited by a government refusal to allow the Kabaka hold a royal function in Kayunga District where a section of the minority Banyala are seeking a break away from Buganda. President Museveni blamed the bloody events of the time that has heavily strained relations between Buganda kingdom and his ruling NRM government on tribalised incitement by CBS radio in which Mengo owns majority shares. It has also emerged that Thursday’s State House meeting settled that disaffected CBS staff who sued the government over closure of the radio immediately abandon litigation or the government will freeze dialogue with the broadcaster and let the courts decide. CBS was also asked to re-apply for a new broadcasting licence after the initial one was revoked during the station’s shutdown some four months ago. “[CBS management] must ensure that all those people consistently breaching the broadcasting standards should not appear on air again. The station’s management should be immediately changed; employees who incited riots be nowhere in the employment list,” a minister told this newspaper, reading from resolutions of the night meeting. It is these set of conditions that the government says CBS has ignored – provisos the radio managers deny knowledge of – that President Museveni reportedly seized on at Thursday’s meeting to indict CBS on its current predicament. “CBS management is responsible for the delays in re-opening of the station,” Mr Museveni is quoted to have told his ministers. Yesterday, Mr Kaaya, the radio MD who is also a shareholder, said he was surprised to learn of the decision from the media because “we have never once before been informed of the conditions”. “Until we have got those conditions officially, I cannot comment and when we get them, I will sit with the Board [of Directors] and we decide on what to do accordingly,” he said. Saturday Monitor has learnt that CBS management met with President Museveni on Friday last week and held follow up discussions with Information, Communication and Technology Minister Aggrey Awori shortly before Thursday’s Cabinet meeting, arguing a case for reinstatement of the station’s operations. Mr Awori, whose ministry oversees the communications sector, including broadcasters, heads an ad hoc Cabinet committee formed purposely to handle the CBS closure, a thorny issue for the government on an election eve. Information Minister Kabakumba Masiko who sits on Awori’s committee, told Saturday Monitor yesterday that: “As a government, we are willing to forget and forgive if the CBS management is cooperative.” It has emerged that another team of ministers, only those with legal qualifications, has been tasked to re-package the expanded pre-conditions to keep CBS in check and Mr Awori, as the line minister, will chair this committee. The High Court in Kampala has dismissed a counter suit filed by the Ugandan government against the Central Broadcasting Station (CBS), which was shut down in September 2009 on allegations of inciting violence. On September 10 2009, the Broadcasting Council shut down and revoked the licence of CBS for allegedly using it to “mobilise and incite the public and sowing seeds of hatred among Ugandans” leading to the death of more than 27 people during the riots that followed a standoff between the central government and the seat of the Buganda kingdom. CBS is owned by the Buganda Kingdom. Over 100 CBS employees later filed a lawsuit asking court to declare the revocation of radio station’s licence “unconstitutional, illegal, unlawful, null, and void”. The employees also sought about Shs 3 billion in compensation, arguing that the “unjustifiable” closure had rendered them jobless. 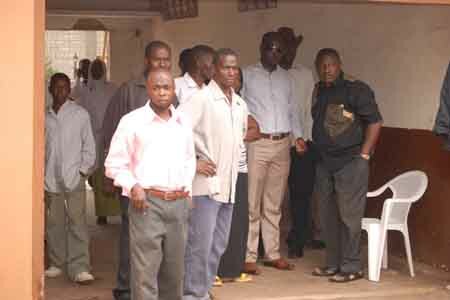 However in February 2010, the government also filed a counter suit seeking to compel CBS to pay aggravated damages for allegedly mobilising and inciting the public into violence and rebelling against lawful authority. On August 20, High Court Judge Vincent Zehurikize dismissed the government’s suit with no costs to CBS. He said that authority to take disciplinary action against any media house lies with the Media Council and not the government. The ruling paves way for the continuation of the case in which the CBS employees want the government to reopen the radio station and also pay them Shs 3billion in compensation in lost earnings. Mr Ssempebwa added that the suit filed by the CBS employees will resume in October this year. “The employees still have their case for compensation; that one we shall argue,” he said. CBS radio was one of the four stations that were shut down in September 2009 after the dramatic standoff between the central government and the Buganda Kingdom. The other three stations, Suubi FM, Radio Sapienta, Radio Two (Akaboozi Kubiri), were later opened with stern warnings after they apologised for the misconduct of their employees. They were also forced to dismiss some presenters and journalists that the government complained against. Critics and human rights defenders accused the Broadcasting Council of acting on the orders of a government that was besieged and condemned the decision to shut down the radio stations as a gross infringement on freedom of expression. The closure of the four radio stations is reported to have had a chilling effect on journalists from other media houses, who were reported to be exercising undue self-censorship. Others claimed receiving orders from their managers or radio station owners not to focus on the Buganda kingdom and other controversial political stories. In January a Cabinet sub-committee formed to address the CBS closure came up with 12 conditions for reopening the radio station. CBS management was required to apologise to the government “through the Broadcasting Council”, relocate its studio from the Kabaka’s palace (Bulange), withdraw the court case brought by employees against the government, dismiss journalists and presenters who allegedly participated in inciting the September riots, and follow the minimum broadcasting standards. Buganda’s attorney general Apolo Makubuya wants the Uganda Broadcasting Council to accord CBS radio a public hearing that will determine whether its owners should apologise or not. He also dismissed the Government’s other conditions for re-opening the radio station. CBS was shut down last September following riots in parts of Buganda. President Yoweri Museveni, in a meeting with Buganda MPs at the time, accused CBS of inciting the public, promoting sectarianism, “at one time talking of people with long noses” and telling lies about the land bill. The Cabinet last week recommended that CBS management should apologise, relocate its studios from Bulange, withdraw pending court cases against the Government and follow the broadcasting standards before it can re-open. Museveni, while touring Mpigi district, repeated the Cabinet decision that the proprietors of CBS apologise for inciting violence that led to the death of over 20 people and left a lot of property destroyed. He wondered why army generals and the Cabinet were at the forefront of the CBS negotiations and not the broadcasting council. “General Tinyefuza’s missive to Gen. Salim Saleh of January 12 and Gen. Museveni’s demands for the owners of CBS to apologise for the September 2009 riots as a precondition to reopen CBS radio must be puzzling and disturbing to many,” the attorney general stated. “Why are army generals not so keen on the trial of the trigger-happy security personnel that killed 27 Ugandans during the riots?” he asked. He also alleged that the broadcasting council has not been allowed to independently deal with the matter due to external interference. He was optimistic that if an independent and impartial inquiry is set up, CBS would be exonerated and some people would be required to apologise for undermining the Constitution and the rule of law. “Since the Buganda kingdom respects the rule of law, abhors impunity and cherishes peace, if such inquiry found CBS or its agents responsible for any breaches, then the army generals and others will well be within their rights to demand an apology,” Makubuya said. He said the conditionality to CBS is largely lifted from Gen. Tinyefuza’s ideas and demonstrates the Government’s “unfriendly intentions” towards Buganda. THE government has set tough conditions for the re-opening of Central Broadcasting Services (CBS) radio, including moving out of Bulange, the seat for the Mengo government. The licence of the Buganda kingdomowned radio station was revoked for allegedly inciting violence. After a heated meeting at State House, Entebbe that lasted from 8:00pm on Thursday to 3:30am on Friday, the Cabinet resolved that the radio management must apologise for inciting violence and civil unrest. CBS was shut down by the Broadcasting Council, following violent riots in Buganda on September 11, in which over 27 people died, while scores were injured, with property destroyed. This was after the Government blocked Buganda’s traditional leader, Ronald Muwenda Mutebi, from visiting Kayunga for the Buganda youth day celebrations. Sources said the meeting, chaired by President Yoweri Museveni, considered a report by a Cabinet committee, which looked into CBS affairs and adopted its recommendations. An 11-member Cabinet sub-committee, headed by ICT minister Aggrey Awori, sought opinions within Buganda, on the closure and reopening of the station. Other committee members were ministers Namirembe Bitamazire, Rukia Chekamondo, Sulaiman Madada, Kabakumba Masiko and Khidu Makubuya. Another condition is that CBS employees must drop all the pending court proceedings against the Government. A group of the radio station’s workers have sued the Government over the closure. Through their lawyers Katende, Ssempebwa & Co. Advocates, the workers say they were rendered jobless by closing the station. They also argue that since the closure, the station has recorded financial losses and is seeking compensation. In addition, the Cabinet resolved that CBS must meet the minimum broadcasting standards set out in the Electronic Media Statute 1996.
that promote the culture of violence or ethnical prejudice among the public. According to the statute, the programmes must also be free from distortion of facts, not create public insecurity or violence and must be balanced to ensure “They have to meet the conditions in the electronic media statute before they are licensed again,” said a source. Besides, the Cabinet also resolved that CBS must move its studios away from Bulange. “They must de-link themselves from the kingdom if they want to operate smoothly,” added another source. After the stormy meeting, a sub-committee, chaired by Awori was formed to work out the final cabinet position, which will be communicated to CBS management. 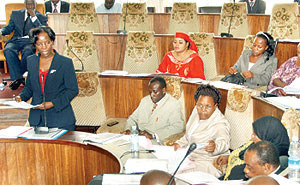 Attorney General Khiddu Makubuya and local government minister Adolf Mwesige are other members of the sub-committee. Sources added that a few ministers wanted CBS re-opened immediately, fearing that the continued closure would make the ruling party unpopular in Buganda. But the majority view, according to the sources, said they must meet the conditions first. One of the biggest victims of last week's riots in Buganda is free speech. The government ordered the closure of four radio stations and suspended at least five journalists and a presenter. Inside Politics' Ismail Musa Ladu and Sheila Naturinda face-off the chairman of the Uganda Broadcasting Council, Mr Godfrey Mutabazi and Dr Peter G. Mwesige a journalist and media scholar over the developments. The government closed four radio stations- accusing them of inciting violence and spreading a hate campaign. What's your take? Mutabazi: That was absolutely in order. The government took the decision to close because at that time two people were already dead. How many more should we have waited to die before coming in yet it was clear that what was coming from these radios were not helping matters. Mwesige: The government's action - and here I guess the Broadcasting Council and government are one and the same - was excessive. We have laws, draconian ones I must add, that the government could have invoked to bring "offending" radio presenters to order. They did not have to close the radio stations. Kalundi Serumaga was arrested allegedly for utterances he made on WBS but the station was not closed. And here I am not condoning Kalundi's arrest, which was equally unwarranted, but pointing out the contradictions in the government's stance towards the media. I must add, however, that journalists and media owners should also recognise that there is a section of the public that supports the government's decision to close the radio stations because they felt they had overstepped their mandate and were in fact promoting ethnic hatred and inciting violence. They should recognise the legitimate fears out there that if they don't exercise their power with responsibility, there is a real danger that they could indeed incite violence and ethnic hatred. We are often reminded about what happened in Rwanda where Radio Mille Collines used hate speech to add fire to the fuel of genocide. But we must also recognise that African governments, including ours, have exploited these fears to muzzle legitimate expression and press freedom. We should distinguish between hate speech, which should be condemned, and dissent and criticism, which are legitimate. Was the closure of radio stations the answer to the violent demonstrations? Mutabazi: Absolutely. They were. These radios were mobilising people against the authority. The police had issued clear instructions about the whole thing but these radios were opposing that - the authority of the police. Mwesige: The riots provided the trigger for the closure of the radio stations, but this is something we had seen coming. The President had been warning radio stations and other media houses. In April 2007, I attended a meeting where the President accused radio station owners of "irresponsibility and irrationality" by allowing their media houses to be used by what he called saboteurs - his description of the political opposition. He blamed the media and saboteurs for the deaths in the Mabira demonstration and reminded the owners that their stations had been "licensed to inform, educate and entertain, not to "annoy, insult, misinform and sabotage". At the same meeting, the President revealed that he had instructed his security agencies to monitor programming on all radio stations and bring to his attention those that break the law. Now, I have always been a big advocate of quality in the media. The media indeed have the responsibility to be accurate and fair but the government is wrong to criminalise their failures in that direction. Human rights organisations have condemned the closure of these radio stations, saying it's an abuse of freedom of expression. Is there a limit to freedom? Mutabazi: Definitely there are limits to freedom of expression. What is more important than the right to live? So I don't agree that freedom of expression is more important than the right to live so we have a duty to protect that. Mwesige: Article 29 of the Constitution provides that every person shall have the right to freedom of speech and expression, which shall include freedom of the press and other media. Article 43 of the Constitution provides for circumstances under which this freedom and other freedoms in our Bill of Rights could be limited. It says in the enjoyment of the rights and freedoms prescribed in our Bill of Rights, no person shall prejudice the fundamental or other human rights and freedoms of others or the public interest. But that same article also provides that the limitations on fundamental human rights, including the right to freedom of expression, must be acceptable and demonstrably justifiable in a free and democratic society. In my view, legislation against hate speech, for instance, would probably be a justifiable limitation in a free and democratic society, but laws that tantamount to saying you can't abuse or annoy the President would not pass the constitutional bar that our Supreme Court has set. That is why I am hoping that the Supreme Court will soon strike down the law of sedition, under which Serumaga was charged. Serumaga accused the President of poor upbringing and blamed this for Uganda's current crisis. Now, it may be bad manners for Serumaga to use the language he used, but surely that is protected speech. Similarly, the President may have a point about radio stations being used to incite violence and ethnic hatred, but he loses my sympathy when he justifies their closure on the additional grounds that the stations were abusing him and the NRM. I think as Uganda's chief "abuser", the President should recognise that this comes with the territory. It is obviously distasteful when we allow our politics and public dialogue to be characterised by abuses and insults, but we face a greater danger when we criminalise expression simply on account of it being annoying or uncomfortable. The government has accused some radio talk show presenters of deviating from the principles of journalism. Shall we see government coming up with strict regulations on the presenters? Mutabazi: There are already laws regulating presenters. However, we don't believe in censorship but a good job. Mwesige: You bet. As we approach the 2011 elections, we are going to see more moves by the government to rein in the media. I think talk show hosts and radio presenters as well as journalists have a responsibility to conduct research, to correct distortions on the airwaves, to be fair and all that. But I don't agree that they should be sent to jail for violating these standards which many of us hold dearly. Is the rapid increase of FM radio stations to over 40 in the last 10 years a sign of development or disaster? Mutabazi: It is a sign of development and our policy is to spread it across the country. The only problem is the misuse of this platform. Most of the producers and DJs or presenters are not qualified and this is something we want to sort out so that we have qualified and objective people. Mwesige: As long as the spectrum is regulated and listeners can get clear signals from whatever station they choose to listen to, I don't see any disaster here. But I must add that the proliferation of radio stations has not necessarily improved the quality of information out there. What should the government do to help the media in Uganda maintain ethical standards? Mutabazi: Not all qualified journalists are angels. For example, the performance of WBS talk show host and the one of Mr Sserumaga was uncalled for.Mr Kibazo should have taken charge of the programme; this is not like the print media where somebody has a choice to buy the copy or not. Mwesige: The government should support the creation of more credible and independent regulatory bodies that can conduct research on media performance and practice and use civic mechanisms to hold those who violate ethical standards accountable. It is disturbing that the Broadcasting Council is known for either denying licences to radio stations or closing them. It is not known for providing meaningful media monitoring information that civil society and the media could use to hold journalists accountable. Instead of investing in such activities, the President is busy giving public resources to security organisations that are now charged with the extra responsibility of media monitoring. I hear the Uganda Police even has a media crimes desk! The government should also ensure that all its departments facilitate fast citizen access to information. It should tear down the walls of secrecy and the culture of silence around many official operations. Even the qualified journalists have fallen prey to the law. Is this an issue of qualifications or intimidation? Mutabazi: We intend to interact more with the media and organize several workshops and seminars to sensitize the media. We also need to ensure and enforce the minimum qualification of people in the media. Mwesige: It is very difficult to operate in an environment where one man decides what is acceptable speech and what is not. I mean I can understand, even as I disagree, the government's decision to charge journalists under our draconian laws. At least we know those laws and we should continue the struggle to have them repealed or amended. But what about recent moves by the government to arrogate itself the right to decide who can host a talk show on Radio One or WBS? Under what law are these people operating? IS MUSEVENI GOVERNMENT IN CONTROL? WHAT LOGIC IN MARTYRS DAY FOR UGANDANS? DOES PRESIDENT MUSEVENI HAVE REAL FRIENDS?